It happens to all of us. We wake up one morning and are surprised to find ourselves suddenly in midlife when we feel no different than we felt yesterday. Right about the time we reach age 40, we may begin to realize that we are not invincible, and that we need to take steps to protect our longevity and long term health. While we may look forward to many active years ahead, how we live now will determine how we live in later life. Practicing prevention with a healthy lifestyle, while we are young, will result in healthier years ahead. It will also reduce the risk of developing preventable chronic diseases and gender specific health issues associated with aging. As well, a dismissive attitude towards prevention can have dire consequences in the long term. According to the Cleveland Clinic, the top health concerns for aging men are prostate cancer, cardiovascular disease, erectile dysfunction, weight management, diabetes and stroke. Men’s protein needs are proportionally greater than women’s, especially when combined with regular physical activity. Physically active men who wish to maintain lean muscle mass as they grow older require more protein than sedentary men. As metabolic rates decrease with age, good quality protein along with vitamins and minerals help to maintain both lean muscle mass and energy levels. Good nutrition is needed to maintain immune function and overall health, as well as to protect muscle, bone, prostate, cardiac and vision health. Antioxidant vitamins that help prevent oxidative damage also become more important with aging. Older adults need more calcium and vitamin D to help maintain strong and healthy bones. Fiber keeps the gastrointestinal tract running smoothly and helps to reduce cholesterol and maintain weight. Cardiovascular health – The American Heart Association indicates that one in three adult men have some form of cardiovascular disease. Blood pressure, cholesterol, triglycerides and homocysteine levels begin to creep up with aging, increasing the risk for heart attack and stroke. Adult men should monitor their cholesterol and blood pressure levels, as high levels are known contributors to heart disease, and high blood pressure is common in younger males. Essential nutrients for heart health include omega-3 fatty acids for decreased inflammation, and maintenance of healthy blood pressure and cholesterol levels; folate and vitamin B6 for maintenance of healthy homocysteine levels; CoQ10 for maintenance of cellular energy; healthy fats for reduced cholesterol and triglyceride levels; polyphenols, to aid relaxation of blood vessels and lower blood pressure; and antioxidants such as resveratrol, to combat oxidative stress and reduce free radicals. 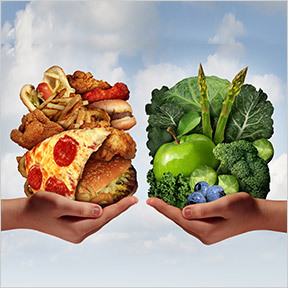 Weight management – As we age, metabolism slows and exercise becomes increasingly important. Eating for health and controlling portion sizes are critical to maintaining a healthy weight. A poor diet that includes salty and highly processed foods contributes to hypertension, high blood sugar and ultimately, obesity, poor health and a host of age related chronic illnesses. Healthy foods for weight management include eggs, leafy greens, cruciferous vegetables, fish, lean proteins, beans and legumes, and healthy fats such as avocado. Diabetes – Along with the current obesity epidemic, type 2 diabetes is a significant health concern for older men. Blood glucose levels should be monitored, as blood sugar can frequently be maintained or lowered with a healthy diet and lifestyle, often warding off pre-diabetes, diabetes and insulin dependency. The American Diabetes Association recommends that those eating a largely plant based diet should be sure to get sufficient amounts of vitamin B12, omega–3 fatty acids, calcium, vitamin D and iron. For diabetes prevention, the Harvard T.H. Chan School of Public Health recommends exercising to reach and maintain normal weight, following a healthy nutritious, low glycemic index diet, not smoking and limiting alcohol. Eye health – Changes in vision and hearing loss are relatively common for people in their 40’s. Many will typically notice problems with close range vision especially in low light. Some may experience floaters or dry eye syndrome. Good nutrition and eye friendly nutrients such as lutein, zeaxanthin, vitamins C and E, zinc and essential fatty acids support and preserve long term vision health, and help to reduce the risk of developing age related eye diseases such as macular degeneration, glaucoma or cataracts. Prostate health – The majority of American men develop benign prostatic hyperplasia (BPH), commonly known as an enlarged prostate. A prostate-healthy, largely plant based diet that includes legumes, garlic, onions and flax seeds, plus other modifiable lifestyle factors, including regular physical activity, can prevent or positively influence progression of the disease. As obesity is a risk factor for developing BPH, a diet high in vegetables, fruits, fiber and nutrients can help ward off weight gain, thereby supporting prostate health. Lycopene, found in tomatoes, red grapefruits, papaya and other red fruits and vegetables, helps to lower the blood levels of antigen, a protein connected to prostate inflammation and BPH. Stress management – Chronic stress is a known high risk factor for coronary disease. Participation in regular exercise, healthy amounts of restorative sleep and relaxation techniques reduce stress and help allay future health concerns. Healthy eating is crucial to provide immune and energy support during times of increased stress. Whole, unprocessed foods that contain fiber and phytonutrients boost immune function and help maintain overall health. As stress creates a greater physiological demand for energy, oxygen, and circulation, a daily vitamin and mineral supplement can provide micronutrient support. Supplements including antioxidants, B vitamins and omega-3 fats are particularly important for those under stress. 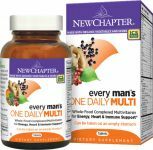 Every Man’s Once Daily by New Chapter – This whole food complexed multivitamin is specifically formulated to meet the needs of active men and provide support for immune function, energy production and cardiac health. Gluten free, Non-GMO vegetarian formulation. Trilogy Men by Vibrant Health – This unique product supplies a daily power pack that includes a 100% organic plant based multivitamin, mercury free EPA and DHA fish oil, as well as a 12 strain probiotic. It provides 20 billion CFU of helpful microorganisms in support of healthy blood sugar levels, cardiac health, energy production and immune and overall health. Gluten and soy free, Non-GMO formulation. Al’s Formula Basic Nutrients for Men over 40 – This comprehensive formula, specifically designed to meet men’s nutritional needs, provides prostate support, promotes healthy cardiovascular function and supplies all essential nutrients for overall health. Gluten, soy and dairy free, Non-GMO vegetarian formula. Enzyme Nutrition Multi-Vitamin for Men by Enzymedica – This product provides 100% whole food and enzyme activated nutrients that enhance the utilization of vitamins and minerals. The formula includes guaranteed potency probiotics, nutrient rich superfoods and daily botanicals in order to support increased energy and stamina, heart health, and immune function and to promote longevity. Gluten, soy and dairy fee, Non-GMO vegetarian formula. MultiMedica for Men by NuMedica – This comprehensive multivitamin, mineral, botanical and amino acid formula is designed to meet the unique nutritional requirements of men. This product provides overall wellness support and antioxidant protection, along with prostate, liver and adrenal supportive nutrients. Gluten and dairy free. Homocysteine Factors by Pure Encapsulations – This high quality product provides activated vitamin B6 and bioavailable folate in support of the maintenance of healthy homocysteine levels. Gluten and soy free, Non-GMO vegetarian formulation. In order to support healthy aging, retain both physical and mental wellness and manage chronic disease, eating well as we grow older is critical. The diagnosis of malnutrition, which can be described as “insufficient food intake, as compared with nutrition requirements,” affects our most vulnerable populations, the very young and the elderly. Malnutrition among mentally competent seniors, who visit hospital emergency rooms nearly 20 million times each year, is startlingly high and a cause for increasing concern. According to The National Resource Centre on Nutrition, Physical Activity and Aging, one in four older Americans currently suffers from poor nutrition. Addressing the nutritional needs of our senior citizens represents an important public health issue, as the elderly population is expected to reach 72 million people by 2030. By 2050, fully 20% of the population will be over 65 years of age. Research shows that malnutrition is not only prevalent, it is often misdiagnosed or unrecognized. Statistics show there may be over one million homebound seniors who are malnourished. 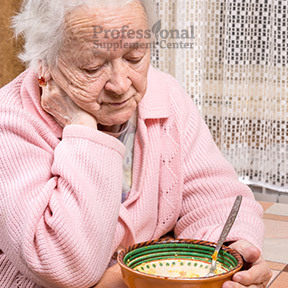 Additionally, as many as 65% of hospitalized seniors and up to 50% of seniors living in long-term care facilities are undernourished. Malnutrition can lead to loss of weight and muscle strength, decreased immunity and mental confusion or disorientation. There are many causes of malnutrition among the elderly, who are put at higher risk for health issues when undernourished. Malnutrition is not an inevitable side effect of aging, although the aging process can promote malnutrition with potentially serious health consequences. The reasons for senior malnutrition can be attributed to physical, medical and social factors. Uncovering signs of malnutrition at the earliest stages can help prevent later complications. If you are a senior or a caregiver, be alert for signs such as weight loss, poor wound healing, easy bruising or dental difficulties. Consult with your healthcare provider about the risks of malnutrition and the side effects of medications. Be sure to discuss nutritional supplements. Dietary changes can make a big difference, as food insecure seniors have demonstrated significantly lower intakes of vital nutrients, including protein, carbohydrates, saturated fats, B vitamins, magnesium, and zinc. Be sure to eat, or encourage your loved one to eat, nutrient dense foods, including fresh fruits and raw veggies, nut butters, eggs and whole dairy products. Make food more exciting by experimenting with spices and herbs and encourage healthy between meal snacking. Promote good health, increased longevity and independence by identifying and addressing elderly nutritional concerns sooner rather than later. 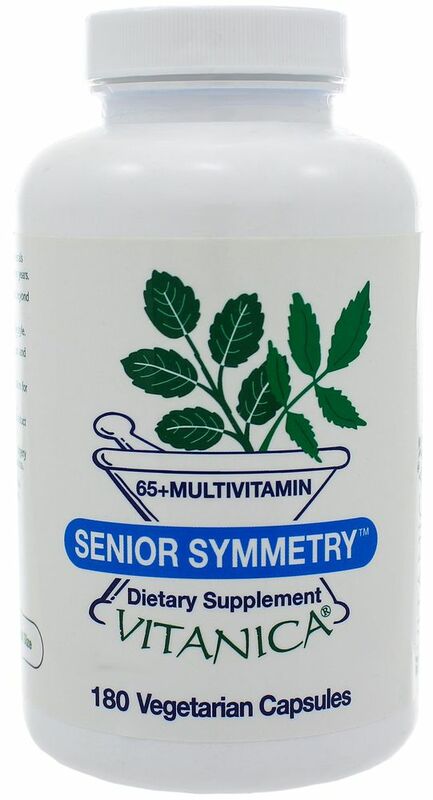 Senior Symmetry by Vitanica – Designed for women over 65 years, this hypo-allergenic, high-potency multivitamin and mineral supplement is formulated with highly absorbable premium nutrients. Depending on the dosage, this formula can complement a balanced diet, provide a well-balanced therapeutic level of nutrients or provide high-potency supplementation for chronic illness. Dairy, soy and wheat free vegetarian formulation. Enzyme Nutrition Multi-Vitamin for Men by Enzymedica – Formulated specifically to meet the needs of men, this product provides 100% nutrient dense whole food, enzyme-activated nutrients along with guaranteed potency probiotics in support of heart health, immune function, increased energy and healthy aging. Dairy, soy and gluten free, Non-GMO formulation. Also available Enzyme Nutrition Multi-Vitamin for Women 50+. Multi+Pro F50+ by Genestra – This advanced multivitamin formula, designed specifically for women over 50 years, provides support for overall health, immune function and menopausal symptoms. Proprietary probiotic strains are included for long-term maintenance of the digestive tract and immune support. Gluten and dairy free vegetarian formula. 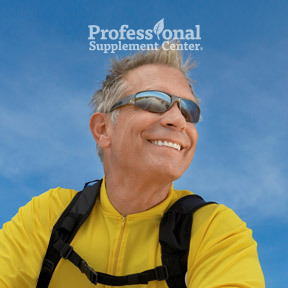 Multi+Pro M50+ formulated for men over age 50 also available.